Find Out How To Get the Most Complete and Compact Educational Package on Earth. Get a jump on your educational efforts with the Earth wall chart, a unique and timely educational tool you can't afford to ignore. Click to preview the Earth Wall Chart! What's On the Wall Chart? Every element on the Earth wall chart went through a rigorous selection process for relevance and accuracy before being included. The information is roughly grouped into 11 topics: (Links to the Earth web site) Global Ecology, Human Conditions, Energy Supply, Food and Soil, Fresh Water, Development & Debt, Wealth, Fishing & Aquaculture, Toxic Pollution and Weapons. 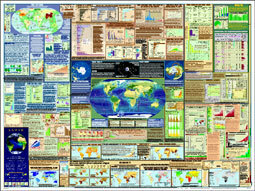 For more on the wall chart's contents, see the sections page on the Earth web site. Are you concerned about the world your children will live in tomorrow, about the environmental and human crisis of today, and about the future of the planet? Have you tried to raise awareness with others and been met with disinterest or disbelief? Have you ever wondered where you could find a single source for getting the REAL PICTURE about what's happening to the world? Because today you can get access to the most compact, comprehensive, and reliable single-source overview of the planet - IN THE WORLD - guaranteed. The Earth wall chart features over 99 carefully chosen charts, maps and graphs designed to bring you a clear and penetrating look at the world's most critical issues and the ways they relate to each other. The condition of the world's forests, laid out in a simple bar graph. You probably know that many people -- perhaps most people -- are not aware enough about the environment to be effective at making change, or taking the vital step of getting others educated and involved. But we want to change that. That's why we put up this web site with the results of years of research on it, completely free, in the most accessible format we could come up with - graphs and maps where one can SEE the state of the world. The web site is visited by over 100,000 people like you each year. But the internet has limitations. Can you carry your computer in your back pocket to pull out whenever you need an important fact? Can you put your computer up on the wall where your relatives and friends can't avoid looking at it? Can you spread your computer out in front of a class of eager students and watch the glow of comprehension spread across their faces? NO, OF COURSE NOT! That's why we published the Earth wall chart. Because the facts need to be seen. See It With Your Eyes. Humans are suited to understand things visually, not just mentally. Research has shown that people learn many times faster if they can SEE what they're learning, rather than just thinking about it. There's nothing like a political agenda to make good information hard to swallow. With this in mind, the Earth wall chart includes only well referenced, nonpartisan data, giving you a reliable foundation for thorough education on the issues that matter most. Each map, graph and chart is accompanied with a source reference, most of which are accessible online. We didn't just want to find the most important information about the planet. We also had to find information that was reliable enough that nobody could contest it. And that's what you get with the Earth wall chart. 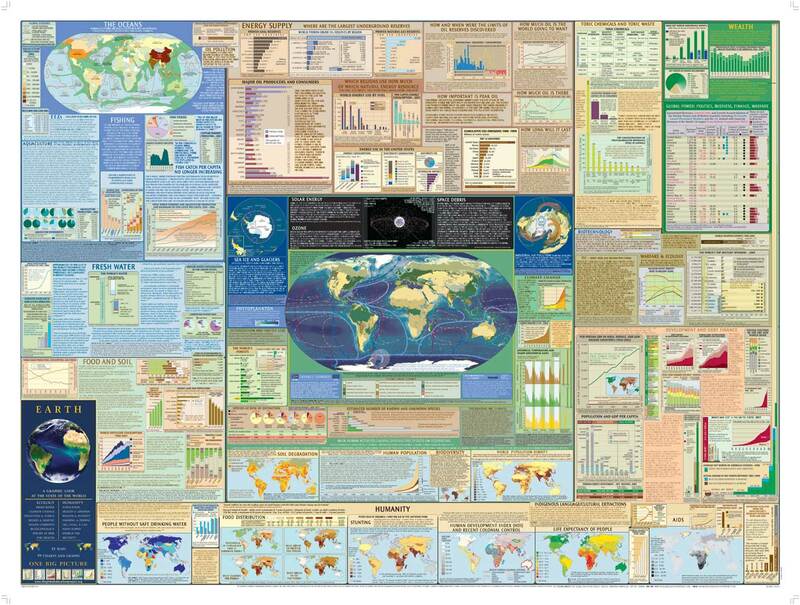 "A Book on One Page ... And More"
Packed with over 99 incredible charts and maps, the Earth wall chart gives you what you can't get anywhere else: a concise overview of the state of the entire planet on a single page. Gain a quick comprehension of the world's most important issues -- the ones that have the potential to threaten the future of life as we know it -- we've put together the most important info so you don't have to. Put the wall chart up on your wall for convenient, time saving education -- whether for yourself, your friends, students, co-workers, whatever -- everyone has something to learn from this wall chart, guaranteed. Get all the data you need in one place. Comprehensive, impartial information on a wide range of issues. Travel with a convenient, portable storehouse of reliable facts about the planet, handy for on-the-spot conversations or educational opportunities. EARTH supplies the hard facts and figures when and where you need them. Be certain you've got it right. Each chart, map, and graph is referenced to an authoritative source. No debates on questionable facts. Easy and quick to verify. We're so sure you'll be totally DELIGHTED with the educational power of the Earth wall chart, we're offering a complete no-risk guarantee -- if you're not 100% satisfied that the Earth wall chart is the best single resource on the state of the planet IN THE WORLD, simply return it within 30 days for a full refund. YOU CAN'T LOSE with our 100% Satisfaction Money Back Guarantee. Get the Earth wall chart together with the new Earth Presentation Package and receive a 30% discount on your entire purchase! Or, get 10% off your combined order of a laminated Earth wall chart and a folded pocket version! Hurry, ORDER TODAY! View the order form for details and more great package discounts! P.S. Our previous wall chart covering the Middle East is in use by over 400 colleges and universities in Canada, US, and internationally, as well as thousands of individuals and organizations. Click here to find out what some of them had to say about the Middle East wall chart. The 27" by 36" Earth wall chart is available folded (fits in your pocket), or laminated for a beautiful long-lasting finish. Image size and quality have been greatly reduced to speed page loading. "This accurate and beautifully produced map is the single best resource for teaching about the Middle East I have ever seen." "...I've never seen anything like it -- combining detailed information about specific hot-button issues with core data about each country and a spectacular relief depiction of an area bounded by Egypt and India. It will be an invaluable resource for secondary schools and for instructors in college courses." - Dr. Ian Lustick, Associate Director, Solomon Asch Center for Study of Ethnopolitical Conflict, and Merriam Chair in Political Science, University of Pennsylvania. "An intensive study of this wonderful map will impart to the viewer a lot about the problems and crisis that afflict the Middle East"
- Farhat Ziadeh, Chairman Emeritus, Dept. of Near East Studies, University of Washington. "Extraordinarily helpful for me at a time when we so urgently need sound information." "It is a very handy item and we will be displaying it here in our offices. Thank you again. We are very impressed with the map." "a magnificent teaching map....everything you need for a teach-in at your fingertips." �. "extremely useful for me, and I'm sure for many others. Really fine project." "This beautifully produced map is also an impressive compilation of geographical facts, history, and cultural diversity, which will be of great interest and use to anyone who cares about the future of all of the peoples of this chronically and dangerously troubled part of the world." "It's really a fabulous learning tool." "Thank you for distributing this valuable item which is significant in the lives of the people of Iraq and other Middle Eastern countries." "Thank you for doing Americans a great service by objectively considering this information which greatly humanizes what we so blindly call the 'MidEast' ."